It took, in all, four attempts to rescue all of the 25 persons that were aboard. On the first rescue the lifeboat took off the Captain’s wife and two children. After standing off and standing by the vessel, the ship’s Captain requested that the lifeboat make another attempt to rescue a further woman. After the lifeboat had rescued the fourth person, the Athina B had managed to regain some power from her engines and was able to proceed to seaward a short distance out of imminent danger. The rescued people were very wet and cold from their experience, so the lifeboat returned to the harbour to allow them to get some medical treatment. While the lifeboat was in the harbour, the Athina B requested the lifeboat to return to sea to take off a further 11 of her crew. This was done, and the vessel was able to proceed further to sea away from the dangers of the coastline. During this lull, the lifeboat rehoused to inspect the damage that it had received during the rescue of the crew. At about 9pm that night the Athina B was calling for further assistance. She said she was in danger of running aground half a mile SW of Shoreham Harbour. The lifeboat launched again in force 8-10 winds at about low water. 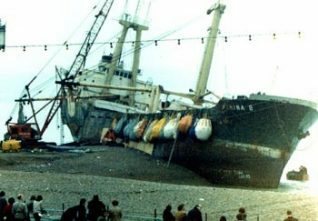 The vessel was not located off Shoreham; it was found to be aground between the Palace Pier and the Marina. A request was made by the Master of the vessel to take off all of the remaining 10 crew. All the crew were duly rescued and the lifeboat returned to Shoreham. It seems a hell of a long time ago now. However, I can remember every single part of it to this day, so it must have made an impression on me and indeed all of us that took part in the rescue. And there were many of us: two Lifeboats and shore helpers, coastguards, police, ambulances, Shoreham Community Centre, and W.R.V.S. Tug Meeching. It was a combined effort by all the services. Many people don’t realise that there were Lifeboat crewmen injured aboard the Newhaven Lifeboat that night. I give my sincere and deepest thanks to all who took part in that rescue all those years ago. The captain was my brother-in-law, so it was my sister and my nieces who were rescued first. You saved their lives and I will always be eternally grateful to you all. Bless you all.